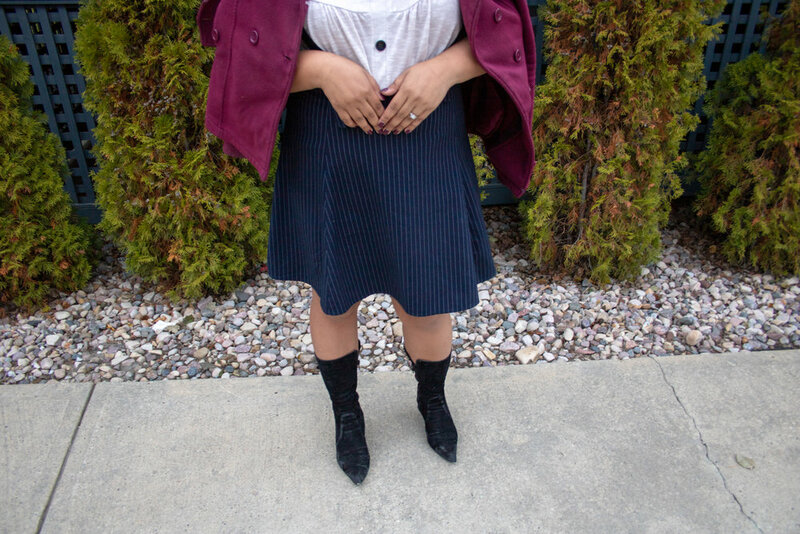 Pulling off a vintage inspired outfit this fall is easy, especially now that vintage shops and online stores are everywhere. I, personally, love wearing vintage clothing because it’s fun, classy and girly. The only downside is that pulling of an entire vintage look can be really expensive. I was looking for some vintage dresses the other day and I couldn’t see anything that is less than $80. The price may sound okay to some but that is way beyond my price range-- especially for a single clothing. So plan B was to mix and match. When looking for a vintage outfit, the first thing I considered is the skirt. Pleated skirts are like jeans, they are timeless. Since pleated skirts never go out of style, I didn’t have a hard time looking for one. I saw this blue striped pleated overall skirt at Forever 21 which was only $30. What I love about this skirt is that it has a combination of modern and vintage. The print on this skirt is not too bold which means you can pair it with anything, even if you’re not opting for a vintage look. The oversized buttons on this white top gave me a lot of vintage feels and is just perfect for my pleated overall skirt. I got this on a clearance sale at Urban Behaviour for only $10. I don’t wear headbands on a regular basis but when I saw this headband at Forever21, I knew I had to get it. It made my vintage outfit more chic and girly. I bought it for only $8.75. My cousin gave me this pair of black suede boots which I think is perfect for my vintage outfit. However, a pair of ankle boots is also a great alternative. As for the coat, I basically live for coats this time of the year so it was not hard for me to look for something that matches my outfit. This whole vintage look only cost me $48.75, to be exact. You can wear this vintage inspired outfit at school, brunch or afternoon coffee dates and even for theme parties. I love how this outfit is so simple and easy— something that you can pull off without being “too much”. Vintage clothing is amazing and I love it when people invest on fancy vintage outfits. I just don’t think it’s for me. I try to look for more practical ways to pull of a style I want without breaking the bank because I know there’s always a cheaper option. Who else is with me?